Gorgeous and bright first floor condo featuring a wrap-around lanai with an unobstructed lake and fountain view! It does not get much better than this. Eastern & southern exposure on the lanai allows for sun most of the day with electric hurricane shutters. Open and airy, great room floor plan with 3 bedrooms, 2.5 baths and 2-car garage. 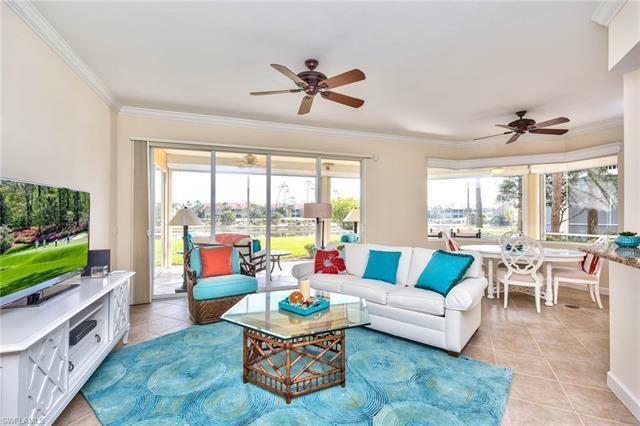 Gorgeously decorated, this Florida retreat is perfect for popping in and out of town or for full time residents. Its located across the street from the neighborhood pool & spa and the main clubhouse is a short walk away. The privately owned Club at Grandezza recently had a major renovation and is simply stunning. Truly a must see! Grandezza is located in the heart of Estero and is close to everything: Hertz Arena, Miromar Outlets, RSW airport, Gulf Coast Town Center, beaches and more!